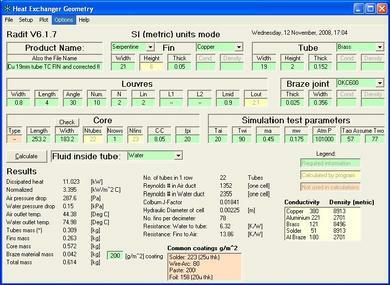 For flat tube serpentine / flat fin heat exchangers, we use a Heat Exchanger Simulation software called Radit. Radit can predict a heat exchanger performance based on the tube and fin geometry alone. 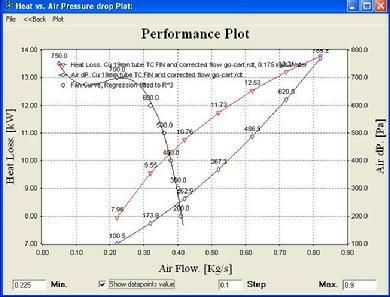 The software can produce performance graphs for a range of flows. It also allows for a fan input to check fan compatibility. Radit also produces all of its computation steps in a printable text format. This allows for an analysis of all the computational steps leading to the results. This step-through process provides a window into the inner-working of the heat exchanger. Radit does not use wind tunnel results to approximate heat exchanger performance but uses first principal flow equations applied onto various core sections, similar in concept to Finite Element Analysis. 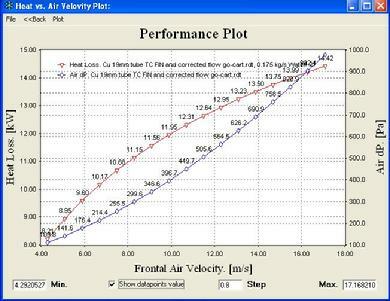 The program has achieved a 95% correlation accuracy when compared to over 2000 wind tunnel test results since 1998.